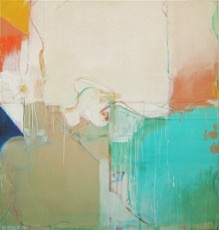 also in White Columns' Artist Registry -New York. from 57w57 press release: This striking body of work serves both as an aesthetically tactile curio as well as a fascinating anthropological record. Hoskins has created a sprawling chronicle of densely layered materials and imagery. Each edition or book within the collection acts as a visually compelling document of time, preserving the definitive materiality of a moment while revealing the transient nature of all things. Joe Nolan, Nashville Scene: Hoskins’ work is equally joyful, meditative, defiant and insightful. 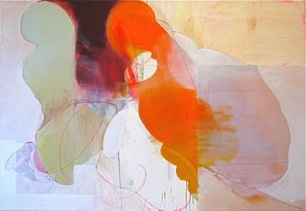 way, playfully and energetically, to expressionistic gestures, lines and mark-making. 2009 U.S.Embassy -Tunis, Tunisia / Art in Embassies Program -U.S.State Dept. U.S. Embassy -San Jose, Costa Rica/ Art in Embassies Program -U.S.State Dept. -from Scott Speh's Hot Commodoties,12 Views at Drawing Center (Soho), fall 2001: Yet another intriguing Selections show at the Drawing Center! I love Moses Hoskins’ dirty collages. They look like Richard Diebenkorn and Richard Tuttle were collaborating in a dumpster outside Office Max, as Hoskins incorporates paper, envelopes, boxes with acrylic, ink, pencil and "diverse tapes" in fresh-funky abstract assemblages. 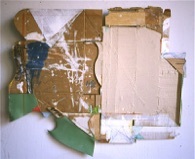 -D. Dominick Lombardi -Inaugural Exhibition for Gallery in Beacon/ New York Times, April 22, 2001 ...Using mostly found, discarded house paint, Mr. Hoskins creates tangled compositions that transmit the transient mind of the artist. Recognizable things like masking tape, drips of paint and drawn arabesques only temporarily hold things in place, as the visual effect of these paintings dart through the subconscious mind of the viewer. 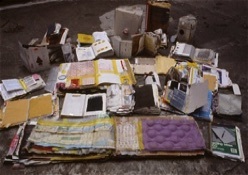 Waterfront Week, Volume 7.6 Mar 27-April 9, 1997 Artburger especially liked Book of Debris by Moses Hoskins, literally an archeologic/ecologic study of the debris on Canal Street that provides ample material evidence of the sweatshops, Chinatown, and fastfood. There is also the irony of carefully turning the pages of a work of art that would be untouchable garbage on the street. 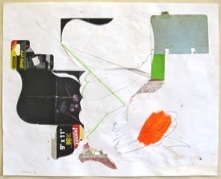 More Fuel for the Debate on Abstraction by Vivien Raynor/ New York Times, Feb.18,1996 Moses Hoskins nudges along the tradition of collage that was established by Kurt Schwitters with two aptly named "Books of Debris". Note: Most work from mid 70’s to mid 80’s consisted of private portrait commissions. Until I was about 31, I thought of myself as a portrait painter. I had learned proper painting technique and had a natural facility for drawing and capturing a physical likeness. Most of my work consisted of privately commissioned oil-on-canvas portraits. Except for charcoal drawings at art fairs, usually subjects did not sit but were rendered from my snapshots. Even then I was aware of the potential for aesthetic shortcomings in "slavish copies" and I did try to get past that. -Midway in this expanse I found myself in school again, this time in Iowa City at the University of Iowa*. I recall meditations alone in the presence of the University's famous Pollock Mural, pondering for what it was I should be doing. After the degree work was finished in '81, I intermittently painted portraits as before. It would be a few years yet, around '86, that I would begin working abstractly. Moses E. Hoskins was born in 1953 in Iowa where he spent his youth and some time as an adult. He was educated in public schools and attended a few colleges* in the Midwest before a BFA later on in 1981 from the University of Iowa School of Art and Art History. As a visual fine artist, his roots were in figurative rendering but he has worked abstractly since the mid 80's. 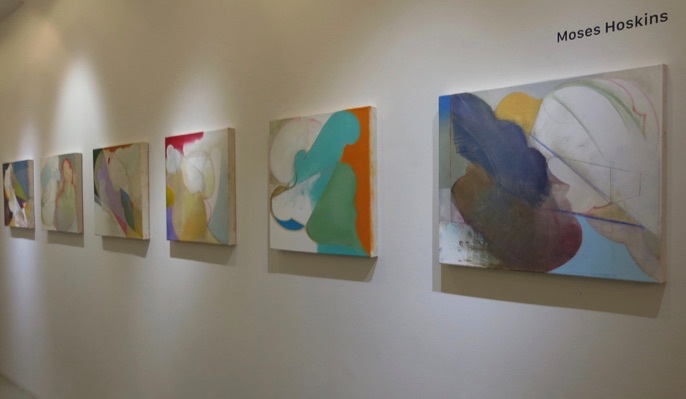 Residing in New York City since 1988, Hoskins exhibits in a variety of venues. He is a recipient of grants for support of his work from the Adolph and Esther Gottlieb Foundation and also from the Pollock-Krasner Foundation**. He was a Yaddo fellow in 2010.